I have been wanting to write a post on the live sheep trade for a long time... literally years. But each time I go to, I have a major block around it because, as you will know if you watched any of the footage recently that Animals Australia bravely got, it is heart-wrenching disturbing. It is the sort of footage that makes you lose your breath, that springs tears to your eyes within minutes and personally, deep in my chest hurts with a sense of shame to be part of a race that still treats a living being in such a manner. It is tough stuff to focus on. Unfortunately there are many horrors in life, such as the live export, that occur today that will continue unless enough people feel that shame and anger. And importantly, instead of turning away because that is much easier, speak out loudly that it is unacceptable. And keep speaking out. Again and again. Until change is brought about and new ways of being can come into the world. 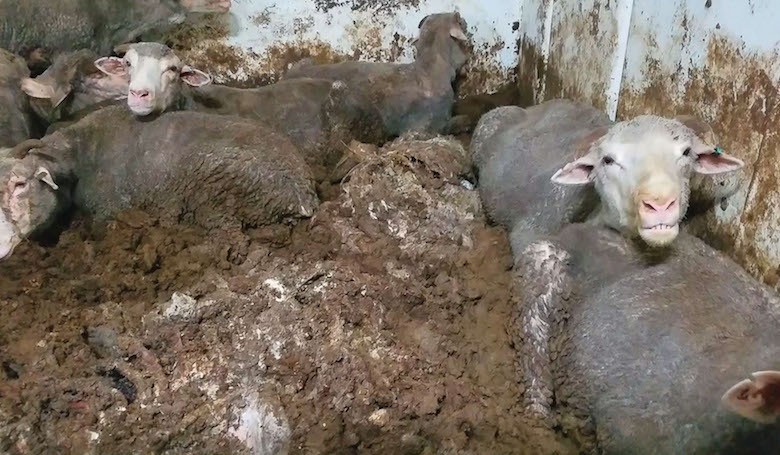 Each time there has been footage of live export, such as in 2011 when ABC's Four Corners aired its award-winning exposé "A Bloody Business," Australians cried out in disgust and objection. Yet it has continued. But enough is enough. Perhaps it was because we hadn't "seen" inside the actual ships - until now. The conditions are appalling. The heat is extreme and the ventilation is little. Which means these animals - tens of thousands of them, are being literally cooked alive. They are so hot that more than 2,500 animals perished from heat stress during an August shipment to Qatar and Kuwait. Animals - living creatures with needs and the ability to suffer - can't reach water or food, are so crowded they were getting crushed to death and get stuck in their own excrement, and can drown in it. If you have some strange block with sheep, which I know some people do, please at least consider these conditions for thousands of dogs. I promise you, sheep can feel the heat, the stress and the suffering just as dogs do. They are not cargo. They are not "things". And they suffer through this for weeks on rough seas. Unless they die from the conditions, which over 3 million animals have on Australian export ships over the last few years. It is cruel beyond measure. And with this new evidence, it proves that this live trade is effectively not even legal. "When temperatures soar — and predictably they do — weeks of untreated waste build up and melts into a thick, deadly soup. Any animal needing to lie down to rest risks being buried in excrement." Up until now, the live sheep export has continued because "that's the way it is done", because of greed and an obvious lack of empathy. A disconnect to the heart. But this evidence provided from five routine sheep shipments to the Middle East proves extensive breaches of regulations resulting in systemic animal suffering. Outcries have been voiced in press and protests across the globe. It is time that the live-sheep trade stops. The pressure is building. The Opposition Labor Party has even said they will ban it if elected. And if there is any fear mongering it will destroy an industry (a girl can dream), we only need to look at New Zealand, who banned it years ago and still has a strong meat industry. Animal Liberation has even pledged one million dollars towards the farmers implementing changes to smooth the transition. This is the time everyone must use their voices because it is at these times we can join forces and all speak out together and make real changes. Don't let it fade away to another horror story we turn a blind eye to. You don't need to be a vegan to realise this extent of animal cruelty is unacceptable. Sign Animals Australia campaign. Watch The 60 Minutes Full Story. Share this blog with friends. Speak Out.